For Chapter 6 I finally decided to cover Restlet versions 1.1 and 2.0. The chapter is longer, but it's fairly comprehensive because of it. My thinking is that if you buy the book because you want to migrate an existing version 1.1 web service to the new and improved version 2.0, then you'll be covered, for you'll know where the differences between each version are. On the other hand, if you buy the book to start developing web services using either 1.1 or 2.0, then you'll also be covered because I go through everything you need to know to create a full RESTful web service from scratch. Note that this book is not only about Restlet. 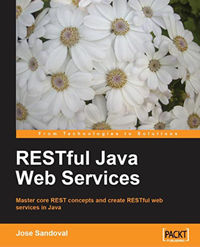 This book is about RESTful Java Web Services. I cover the most popular RESTful Java frameworks today. For example, in Chapter 5, I cover Jersey, the JAX-RS implementation. So if you decide that Restlet doesn't do everything you need, you can play around with the code and compare between them. The advantage of my approach for this book is that I implement the same requirements for multiple frameworks: the code does exactly the same, but using different REST architectures. Chapter 1, of course, covers the theory of REST, but this is a developer's title full of examples and working code. In general, the architecture of a web service doesn't change regardless of the framework you use; however, there are a few subtleties that could give you some grief if you don't know where to look. I've tried to cover all those subtleties in my book. What's more, because of how I've broken down the implementation code, you will be able to compare between RESTful frameworks and then be able to decide which approach works best in your case. I think this entry (or part of it) will become the introduction to the book.